tech-logg: Thinking Of Changing Your ISP? If you're thinking of changing your broadband provider or finally upgrading from a dial-up service, then this may be of some interest to you before you take the plunge. I've been broadband enabled for almost two years now and when I decided to make the leap, I did a fair bit of research on availability, prices and the reputation of the ISPs of the time. What bandwidth or connection speed is offered? What you want to do with the Internet will probably determine how fast you need to doing it at. Heavy downloaders and video browsers will benefit from faster speeds while light surfers and email users will easily get by with lower speeds. The technology is advancing all the time and so are the connection speeds so, while basic ADSL used to offer speeds of "up to 2Mbps", most providers are now offering ADSLMax speeds of "up to 8Mbps" and there are even faster options of up to 24Mbps available. What contention ratios are offered? Contention ratio is basically a count of how many other users are sharing your connection to the exchange. 50:1 is common so you could be sharing your "up to 8Mbps" line with up to 50 other surfers at the same time. That's why you might experience slower performance during "peak" times and why ISPs aren't very happy with users that saturate the line with continuous downloads. Some ISPs offer packages with reduced contention ratios so you get a bigger slice of the bandwidth. What's the minimum contract length? If you want to able to jump ship to another ISP at a moments notice, then this is a crucial factor. Most ISPs will tie you down to a 12 month or even 18 month contract if they can but there are some that don't and offer one, three or even six month contracts. It usually all depends on what incentives are part of the package as the ISPs need to try and recoup that initial outlay. Of course you can migrate at any time but you could be charged a penalty for leaving before a contract ends. Do they provide virus or spam checking? If you don't have (or don't want to have) virus and spam checking software installed on your computer, then whether or not your ISP offers this service may be important to you. How much data can you download a month? Most ISPs put a quota on how much data you can download or upload per month. Even those that don't cite "fair usage" as a means of limiting how much traffic your connection will be allowed. Obviously if you're into downloading movies and music or playing online games, then you will need a more meatier package than, for example, my mum. What happens if you exceed your monthly download quota? Some ISPs use what they call traffic shaping so they can effectively reduce the speed of downloading certain data packet types at certain times of the day. They can also apply this on a per user basis so, if you exceed your quota, then they can reduce your download speeds of certain packet types or even your entire surfing experience. I once had my downloading reduced to 256Kbps for a wee while but it was Christmas and I went a bit mad. Others may allow you to continue downloading but will charge you extra by the Mb. Can you get a fixed IP address? Most standard connections come with a dynamic IP address, which means it can change everytime you connect, but a fixed IP address is required if you want to host your own server or connect to a VPN and it's also useful for accessing your own home network from another site. How much web space, if any, do they provide? This is important if you want to develop and run your own web site. On top of that there are several add-on services for web developers like database and CGI scripting additions that could also be useful. What's the bottom line and how much is all of the above going to cost? What you can expect to pay will depend on what kind of package you opt for but comparing similar packages should help keep costs down. Some ISPs will charge for setting up your connection but many now offer this for free. Others will charge you for providing connection hardware like an ADSL modem or router but again, some don't. Others offer introductory lower prices for several months so take note of the real price you'll be expected to pay. This is designed to make comparing the prices of broadband provider packages and bundles containing different mixes of broadband, phone, TV & mobile connections quick and simple. All you need to do is enter your post code and it'll list the current best deals available to you. On top of that. the site has guides for beginners, buying broadband, choosing the best deal and switching ISP and also includes a section with ISP reviews. 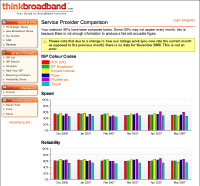 This site is aimed at bringing you UK broadband availability information. It originally started out providing information on BT exchange upgrade progress and to submit pre-registrations for connectivity for those desperate to get onto the broadband ladder but it now contains much wider information on UK broadband availability. 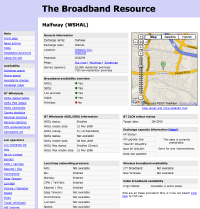 Availability is still its key thing and it provides an availability checker and UK coverage maps but you can also search out your local exchange and find out a great deal more information on how your broadband is supplied. With this you can easily find out if your local exchange is enabled for ADSL, SDSL, Cable or Wireless and which ISPs are operating on LLU in the exchange. There's also lots of league tables, statistics, news and FAQs. Formerly known as ADSLGuide.org.uk, this is one of the best ISP review and comparison sites and it's been around a long time. It has news, guides, FAQs, ISP lists, comparisons and reviews so almost everything you need to choose and ISP is here. They provide independent advice and details on the services offered by broadband service providers so you can make an informed decision as to who to use as your supplier. Another older site thta used to be called Net4Nowt when getting free internet access was the thing. However, it's now a more mature site that has changed with the times and lists a great deal of information on ISPs, broadband (and even narrowband) package deals, news, features and FAQs. A broadband availability checker. Enter your postcode and phone number and it'll return a list what services are available in your area along with a list of the best offers or deals in your area. A service from the Scottish Executive, providing information advice of getting broadband in Scotland. It's a bit narrower in scope than some of the sites above but if you live in a broadband starved area in the highlands or islands, then this site does have a good deal of information and news on exchange activation, etc. It also provides a of of basic information of broadband, security, answers to common questions, how to complain to your ISP and details of initiatives to bring broadband to every community in Scotland. Another useful site that's been around since 2000. It has lots of information on availability, ISP comparisons and reviews, news, etc.